Large grazing animals have been introduced to New Zealand without the agents that have evolved in their places of origin to process their dung. Beetle tunneling leads to increased aeration of the soil allowing water to penetrate better. Tunnelling and dung burial also result in increased grass root growth and biological activity in soils under and adjacent to dung pats. Dung beetle activity, therefore, leads to reduced run-off of rainfall and better retention of dung and urine in the soil. This, in turn, results in reduced microbial contamination in run-off, less leachate pollution and reduced eutrophication. Forgie SA, Paynter Q, Zhao Z, Flowers C, & Fowler SV. (2018). 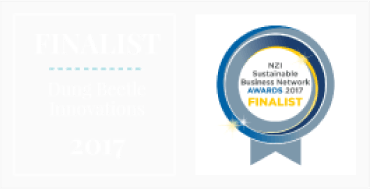 Newly released non-native dung beetle species provide enhanced ecosystem services in New Zealand pastures. Prepared by Landcare Research. McDowell R, Cox N, Snelder T. (2017). Assessing the Yield and Load of Contaminants with Stream Order: Would Policy Requiring Livestock to Be Fenced Out of High-Order Streams Decrease Catchment Contaminant Loads Journal of Environment Quality. 46. 1038. 10.2134/jeq2017.05.0212. Dymond, JR, Serezat D, Ausseil A-GE, & Muirhead RW. (2016). Mapping of Escherichia coli Sources Connected to Waterways in the Ruamahanga Catchment, New Zealand. Environ Sci Technol. 50(4):1897-1905. Richardson P, Richardson R. (2000). Dung beetles and their effects on soil. Ecological Restoration 18:116-117. Doube BM. (2008). The pasture growth and environmental benefits of dung beetles to the southern Australian cattle industry. Meat & Livestock Industry, North Sydney, NSW. ISBN: 9781741912814: 192pp. Brown J, Scholtz CH, Janeau J-L, Grellier S, Podwojewski P. (2010). Dung beetles (Coleoptera: Scarabaeidae) can improve soil hydrological properties. Applied Soil Ecology, 46(1): 9-16. http://dx.doi.org/10.1016/j.apsoil.2010.05.010. Ryan U, Yang R, Cameron G, Doube B (2011). Effect of dung burial by the dung beetle Bubas bison on numbers and viability of Crytposporidium oocysts in cattle dung. Experimental Parasitology 129: 1-4. Stock will not graze around dung pats unless forced to by high stocking rates or having restricted access to pasture, which reduces pasture productivity. Dung burial by the beetles enhances grass growth through nutrient recycling, and increases the amount of pasture available, improving long-term sustainable productivity. Bang HS, Lee J-H, Kwon OS, Na YE, Jang YS, Kim WH. (2005). Effects of paracoprid dung beetles (Coleoptera: Scarabaeidae) on the growth of pasture herbage and on the underlying soil. Applied Soil Ecology 29: 165–171. Bertone, M. A., Green, J. T., Washburn, S. P., Poore, M. H., and Watson, D. W. (2006). The contribution of tunneling dung beetles to pasture soil nutrition. Online. Forage and Grazing lands doi:10.1094/FG-2006-0711-02-RS. Fincher GT, Monson WG, Burton GW. (1981). Effects of cattle feces rapidly buried by dung beetles on yield and quality of coastal Bermuda grass. Agronomy Journal 73: 775-779. Macqueen A, Beirne BP. (1975). Effects of cattle dung and dung beetle activity on growth of beardless wheatgrass in British Columbia. Canadian Journal of Plant Science 55: 961-967. Nichols E, Spector S, Louzada J, Larsen T, Amezquita S, Favila ME. (2008). Ecological functions and ecosystem services provided by Scarabaeinae dung beetles. Biological Conservation 141: 1461-1474. Dung beetle activity reduces reinfection of livestock by parasitic worms. This is achieved by dung beetles directly or indirectly killing the eggs and young larvae of the parasitic worms. They do this in several ways. Firstly, the dung pat dries out faster as it is broken up by dung beetles – this kills parasite eggs and larvae faster than in dung pats without beetles. Secondly, the processing of dung into brood balls by the adult beetles and direct feeding by dung beetles and their larvae kill parasite eggs and larvae. Thirdly, deep burial of dung reduces vertical migration by parasite larvae back up to the soil surface. Fowler, SV. (2013). What is the effect of dung beetles on gastrointestinal nematodes of stock? Prepared by Landcare Research. Prepared for the Dung Beetle Technical Advisory Group. Forgie SA, Paynter Q, Zhao Z, Flowers C, & Fowler SV. (2013). The impact of tunnelling and dung burial by new exotic dung beetles (Coloptera: Scarabaeinae) on surface run-off, survivorship of a cattle helminth, and pasture foliage biomass in New Zealand pastures. Prepared by Landcare Research. Prepared for the Dung Beetle Technical Advisory Group. Fincher GT (1973). Dung beetles as biological control agents for gastrointestinal parasites of livestock. Journal of Parasitology 59 (2): 396-399. Fincher GT (1975). Effects of dung beetle activity on the number of nematode parasites acquired by grazing cattle. Journal of Parasitology 61: 759-762. Gronvold J, Sommer C, Holter P, Nansen P (1992) Reduced Splash Dispersal of Bovine Parasitic Nematodes from Cow Pats by the Dung Beetle Diastellopalpus-Quinquedens. Journal of Parasitology, 78, 845-848. Le Jambre LF (2009). Dung beetles and internal parasites of sheep. Final Report prepared for Meat and Livestock Australia (SUPER PIRD ref. : S2005/NO3). Granite Borders Landcare Committee, Tenterfield, NSW, Australia: 21pp. Faster burial of dung will reduce the incidence of nuisance flies. Blowflies associated with sheep flystrike do not breed in animal waste but females use it as the nutrient resource for maturing eggs. In New Zealand, other nuisance flies such as biting stable flies, house flies, and flesh flies are known to breed in livestock dung. When dung burying beetles and dung breeding flies compete in dung, the beetles win. Survivorship of fly eggs and larvae is significantly reduced by rapid conversion of the dung resource and mechanical damage during dung manipulation by the beetles. Many laboratory and field experiments confirm significant reductions in the numbers of dung breeding pest flies because of dung beetles. Blume RR, Matter JJ, Eschle JL. (1973). Onthophagus gazella: effect on survival of horn flies in the laboratory. Environmental Entomology 2: 811-813. Bornemissza GF. (1970). Insectary studies on the control of dung breeding flies by the activity of the dung beetle, Onthophagus gazella F. (Coleoptera: Scarabaeinae). Journal of the Australian Entomological Society 9: 31-41. Doube BM, Macqueen A, Fay HAC. (1988). Effects of Dung Fauna on Survival and Size of Buffalo Flies (Haematobia spp.) Breeding in the Field in South Africa and Australia. Journal of Applied Ecology 25: 523-536. Graczyk TK, Fayer R, Knight R, Mhangami-Ruwende B, Trout JM, Da Silva AJ, Pieniazek N J. (2000). Mechanical transport and transmission of Cryptosporidium parvum oocysts by wild filth flies. American Journal of Tropical Medicine and Hygiene 63(3): 178-183. Nelson W, Harris B. (2006). Flies, fingers, fomites, and food. Campylobacteriosis in New Zealand_ food-associated rather than food-borne. The New Zealand Medical Journal 119 (1240): 1-7. The burial of animal waste and improved infiltration of urine into upper soils will likely reduce the production of methane and nitrous oxide, and is therefore likely to decrease the emission of greenhouse gases associated with animal waste. While adequate quantification of the influence of dung beetle activity on nitrogen emissions remains to be done, some studies have shown dung beetle activity during feeding and nesting will stimulate aerobic conditions, altering the microorganism fauna in dung pats, brood balls, and associated soils to reduce methane production. And when compared to unburied dung, the speed at which freshly deposited dung is buried by moderate to high numbers of dung beetles is also likely to reduce methane production. cow pats. e! Science News. Holter P. (1997). Methane emissions from Danish cattle dung pats in the field. Soil Biology and Biochemistry 29(1): 31-37. Jarvis SC, Lovell RD, Panayides R. (1995). Patterns of methane emission from excreta of grazing animals. Soil Biology and Biochemistry 27(12): 1581-1588. Whitehead D. (2009). A dairy farm is not greenhouse gas neutral. Landcare Research article prepared for Dairy NZ Ltd. 4 pp. Economic benefits from dung beetle activity will arise from enhanced forage palatability, nutrient recycling and a reduction in pasture pests (e.g. nuisance flies and livestock parasites). New Zealand data are lacking, but conservative estimates from the United States suggest that by burying cattle dung alone, dung beetles are worth approximately US$380 million annually to the US economy. Dung beetles would also provide the same services for other livestock dung. Losey JE, Vaughan M. (2006). The economic value of ecological services provided by insects. BioScience 56(4), 311-323.